Auto-Scheduling is a powerful tool that uses metrics and AI learning to create an entire schedule with a single click. With a single click, Auto-Scheduling will build you the perfect shift structure from scratch, then fill it with the right people to best match your scheduling priorities. This guide will walk you through how to set your business up with Auto-Scheduling. To use Auto-Scheduling, you'll need to set up your demand signals (referred to as Metrics in Schedule), and ensure you add or import enough data for Auto-Scheduling to predict your labour demands. Setting up your demand signals should be a one-off task, though you may need to update them or adjust your Required Staff recipes over time to ensure Auto-Scheduling continues to work for the changing needs of your business. The Auto button combines the two key functions that make up Auto-Scheduling, Auto-Build (creating optimal empty shift structures) and Auto-Fill (filling your empty schedule with the right people for every shift). You can also access each of the functions individually by clicking the drop down menu. Once you have your business set up with Auto-Scheduling, you can simply click this button to create and fill your schedule. Auto-Scheduling uses artificial intelligence to build you the best shift structure for your business, based on as many metrics (demand signals) as you require. A demand signal is anything that affects how many people you need working at any given time. Some examples of demand signals could be sales, foot traffic, food/drink orders, table bookings, tickets sold etc. To add a metric, go to the left panel of the Statistics bar in the Schedule page. For example, if you choose 'Last 6 Periods', it will use the date from the last 6 weeks. Using the 'Same Period as Last Year' allows you to account for staffing impact of one-off major events, like sporting events, public holidays, and holiday seasons. Once you have added a demand signal, a new modal will open allowing you to edit it. Alternatively, you can click into any demand signals you’ve created previously. Here, you can input the data related to the demand signal, for example, how many units of coffee will you sell per hour? You can import the data from previous dates (if you have existing data), import CSV/Excel files, or manually enter the values. You can choose to calculate this in hourly or 15 minute blocks. 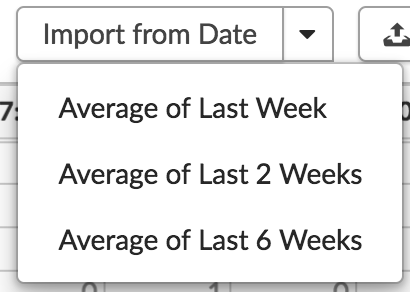 The 'Import from Date' option allows you to import average values from previous schedules. You can use the average values from the past week, fortnight, or the past 6 weeks. Import from File allows you to add data associated with the metric from Excel/CSV files. To download a sample file, click here. Column 3 (Data Value), this will be the imported data. Once you have imported the file you are prompted to match the Deputy fields with the fields from the file you just imported. Click Next, you’ll see the data populate in the form. Each demand signal should relate to at least one area or crossover between multiple areas. Example, if the demand signal is Food Order this would affect both waiter and kitchen staff. The data values should be the same for both areas since the waiter will need to take the orders. You can also calculate the Waiter area with a demand signal called Foot Traffic if you want it separated. Using artificial intelligence, Auto-Scheduling will analyse the data from multiple demand signals, like sales, foot traffic, and table bookings, to accurately forecast how many staff you need for each hour of the day. Click the cog icon next to the signal name. This allows you to edit minor demand signal options, change the name of the metric, line colour that will appear in the Statistics bar, the time period of the demand prediction. Next, you need to enter the data for how many staff you need per hour based on the metrics you just entered for the demand signals. 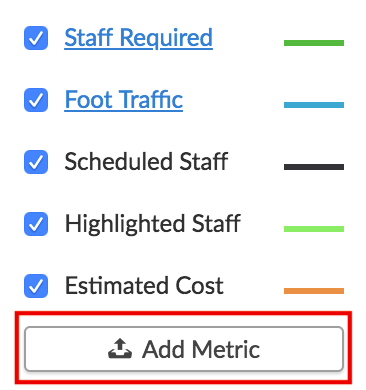 Click into Required Staff on the left panel of the Statistics bar. Here, you can determine the exact number of employees scheduled in each area based on the demand signals you added prior. These are called “Required Staff Recipes”. Click 'Build' to save the recipe, and the number of staff needed every hour will populate in those areas. If needed, you can manually edit it. If an area doesn’t have any metrics (demand signals) related to it, it’s important to leave that area field blank when building a recipe. The bulk update option allows you to increase and decrease numbers across the spreadsheet via percentages. This option allows you to see and enter the data in hourly or 15-minute intervals. The below is an example of the window in an hourly view. While the below is an example of the 15-minute view. Please note that after clicking 15 mins there may be a delay due to the spreadsheet rendering. The Auto button combines the two key functions that make up Auto-Scheduling; Auto-Build (creating optimal empty shift structures) and Auto-Fill (filling your empty shifts with the right people). You can access each of the functions individually by clicking the drop-down menu. Using data from Auto-Build Shift Structure and Auto-Fill Empty Shifts, Auto-Schedule will build and fill a schedule for the current view. First you need to build your shift structure and set your Auto-Fill preferences. Click on the Auto drop-down menu and a modal will open with several preferences. In this box, you can enter the ideal shift lengths (in hours) to be created using Auto-Build. You can add more than one shift length, the order will dictate the priority. Allows you to select whether employee shift times can start on hourly, 30-minute or 15-minute intervals. This button will create EMPTY shifts based on your demand signal metrics and the preferences you added into Auto-Build. This function will only fill any EMPTY shifts, it will not automatically fill OPEN shifts. Once you have your shift structure from Auto-Build or by creating empty shifts manually you can use the Auto-Fill function (accessed via the Auto drop-down menu). A modal will open with several preferences. This button will fill all the empty shifts you have. Read more about Auto-Scheduling from our CEO, Ashik Ahmed here.